Late last season on Arrow, I noted the show seemed unaware that Helix, the hacker group that Felicity had to work with, was screaming evil intentions. For our resident hacker, it seemed incredulous that she was also slow on the uptake; seriously, these guys couldn’t have screamed “bad idea” any harder if they wore shirts saying as such. The ball on that has finally dropped, as Cayden James — the guy that Felicity worked with Helix to break out — has decidedly turned evil after spending eight months locked in a shipping container. Whatever James has planned will end with a couple of hundred people dead, so Felicity and her Helix friend Alena team up to put an end to it. Meanwhile, the Team has a problem that’s not as grandiose, but a dilemma all of its own. Black Siren’s showing back up again, this time disguising herself as random nobodies so she can move freely and kill random nobodies. It’s worth noting that for however brief the scenes in question are, Katie Cassidy is really good in both of them. In the first, she’s seducing a banker and alternating between enjoying playing with him and being bored at how easy of a mark he is. The second scene sees her playing nice with a gym user in a parking lot, and Cassidy makes her seem perfectly not quite right. She’s going through the tropes of a creeper (always smiling, “I like your shoes,” etc. ), but the fact that it’s Laurel makes things even more unsettling than they already are. At first, it feels like a standard episode where the two stories are going to be separate from each other. But then, at long last, we finally get to see Cayden James, and he is indeed Michael Emerson of Lost and Person of Interest fame. Emerson’s clearly a pro at playing someone who is outwardly calm, but also really scary, and if there’s anyone who would be a good step up in terms of being freakishly hypercompetent after Josh Segarra, Emerson would be it. The dynamic between him and Black Siren is the most fascinating of all. He considers their partnership to be a democracy, but she definitely doesn’t, given how easily he lords everything that he’s done for her over her head. James clearly has plans that spell doom for the internet, and they definitely involve Felicity doing part of his legwork for him. While Emerson’s James is ever cryptic and on the ball he’s not exactly surprising. I do hope this storyline doesn’t come to mimic Young Justice, wherein every victory the Team has is secretly a victory (or just minor annoyance) for the villains. Felicity already has a desire to stop him because of her guilt for his actions. Now he needs to consider her as a legitimate threat and not just a pack mule. Make no mistake, Emerson is a hell of a pull for this cast, but right now, it’s more his reputation that’s doing the work of selling the character’s danger than James himself. 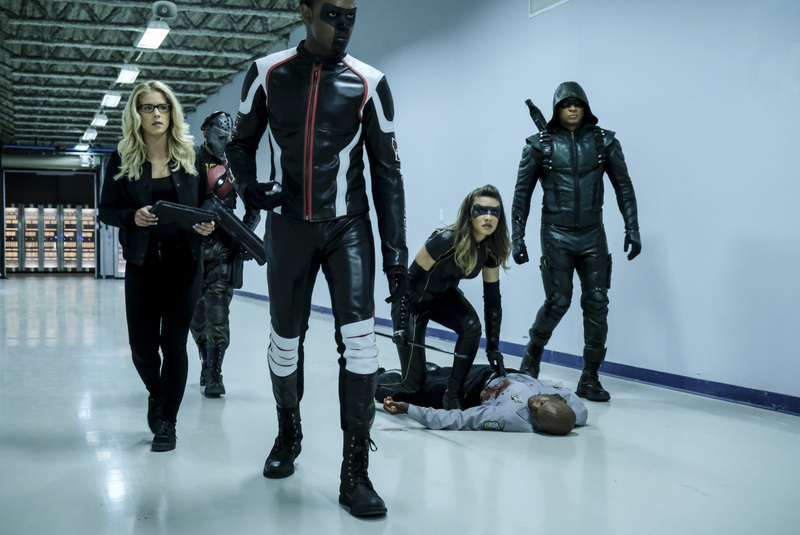 With this being a Felicity heavy episode, it’s only appropriate that Oliver be involved in some capacity, though it’s a much more proactive role than expected. Using common sense, and knowing how Felicity gets when Helix is involved, has him make the very logical decision to tail her, even though it’s also incredibly boneheaded. Now that he’s technically no longer on the Team, he has to do what she used to do for him and be her emotional sounding board for those self guilt trips. Whether it’s because the writers wanted to balance the scales, or just wanted to show how far Oliver’s come as a person over the last five years, having him listen to others vent works pretty well. It’s admittedly effective to have this role reversal for he and Felicity, and having Oliver take a stab at being Overwatch while she’s out on the field certainly doesn’t hurt. But what does hurt is the show’s clumsy way of reminding us how they’re shipping endgame. Having Curtis say he was their most ardent shipper, people commenting on how cute they were together — these just don’t work because they feel like the show pushing the return of their relationship on us. The moments where Oliver and Felicity banter back and forth and keep getting interrupted work much better, and that’s the stuff that works. It doesn’t come anywhere near the bad parts of season three, wherein Ra’s al Ghul straight up told her to go to him, but these certainly are some cons in an otherwise strong episode. Right now, their relationship is fine where it’s at, and as previous history shows, it’s best not to try to force it or throw a monkey wrench into it. Well, unless that monkey wrench is Slade Wilson, but that’s what next week’s episode is for. Rene kind of jokes about it, but it doesn’t seem out of the question that Black Siren is bisexual. One has to get pretty close in order to scream someone to death from inside their head, after all. I would’ve loved for Black Siren to get in one little jab at Diggle when she first meets him suited up as Green Arrow. “You look different” is a dialogue trope I enjoy a lot. I understand the reasoning for this in terms of an action scene, but I find it incredibly funny that Cayden James felt the need to storm the old Helix base with Siren, his right hand man, and over a dozen guys in black masks.